Although Morocco has been a part of Epcot's World Showcase for more than 30 years, it is not an original country from opening day. It has remained largely unchanged since it opened in 1984. 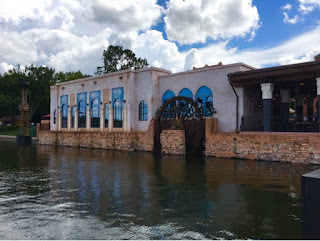 However, there has been a relatively recent addition of a waterfront dining location called Spice Road Table. I took this shot of the exterior of the restaurant a few days ago, from the nearby boat dock.